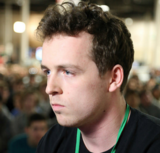 SFAT is a Melee Fox player from Northern California who is currently residing in Southern California, considered to be one of the best Fox mains in the world with his high placements at tournaments. He has wins over Hungrybox, Plup, Leffen, Mew2King, Mango, Wizzrobe, aMSa, Zain, and Axe. He frequently teams with PewPewU in doubles events where they form the team PewFat and the two are considered to be one of the best doubles teams in the world. He is currently ranked 2nd on the SoCal Melee Power Rankings, 12th on the 2018 MPGR, and was formerly ranked 1st on the NorCal Melee Power Rankings. Leffen challenged SFAT to a $1,000 first-to-five money match, to which he accepted. This took place at DreamHack Winter 2015, where SFAT lost 1-5. This ties SFAT with smashers Mang0 and Tian for the biggest loss from a money match. SFAT is the leading actor of You're Watching SFAT, a series of short videos featuring the smasher in bizarre and comical situations that debuted on December 29th, 2015. Sometimes others smashers like PewPewU and Shroomed make an appearance as well. In doubles, SFAT uses the tag "PEW" while his teammate PewPewU uses the tag "FAT". These tags are in reference to the opposite teammates' names, as well as the team name, which is PewFat. This page was last edited on April 21, 2019, at 23:30.